The Canadian Early Career Hydrogeologists' Network of the International Association of Hydrogeologist (IAH-ECHN Canada) represents all students and recent graduates (less than 10 years) specialized on hydrogeology and groundwater independent of the person's age. Our goal is to share career opportunities among Early Career Hydrogeologists and facilitate networking during scientific and professional events. The IAH-ECHN Canada is a national branch of the IAH-ECHN, a network of the IAH. 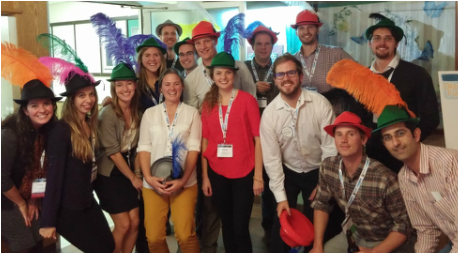 We represent the Early Career Hydrogeologists of the IAH Canada National Chapter (IAH-CNC). All members of the IAH-ECHN Canada are required to be a member of the IAH-CNC. Many incentives and discounts are provided to students, including a FREE option, check the registration details here. The executive board is a group of volunteers with a simple structure composed of a chair, two co-chairs, and a task team. The IAH-ECHN Canada was founded during the 'IAH-CNC 2015 Waterloo Conference' in Waterloo, Ontario, that happened from October 27th to 30th of 2015 and it was organized by the Canadian National Chapter (IAH-CNC). Approximately 350 hydrogeologists took part in the conference, of which 60 were students. The success of the IAH-Early Career Network (IAH-ECHN) motivated members at the conference to create an IAH-ECHN national branch. A group of around 25 ECHs were enthusiastic about the initiative and signed up to be part of the newly formed IAH-ECHN Canada. From this group of 25 ECHs, 11 volunteered to form the first Executive Board.